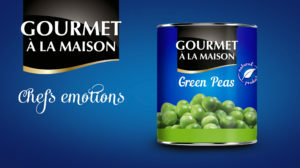 EU Foods offer our green line Gourmet ala Maison – Chefs emotions. Canned vegerables, that saves the fresh taste in every piece. Ready to make every dish- special. Every bite- unforgetable. Green peas are in several sizes- 212ml, 425 ml, 500 gr, 800 gr and 2 500gr. We offer Chickpeas and Lentils in tins of: 400gr, 800gr and 2500gr.